Taking a unique comparative approach to the respective development paths of India, Brazil and South Africa (IBSA), this book shows that people and governments in all three countries are faced with similar challenges of heightened insecurity, caused by liberalization and structural adjustment. The ways in which governments, as well as individuals and worker organisations in IBSA have responded to these challenges are at the core of this book. 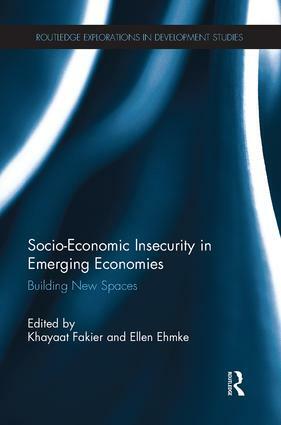 The book explores the nature of insecurity in the Global South; the nature of the responses to this insecurity on public and small-scale collective as well as individual level; the potential of these responses to be more than neo-liberal mechanisms to govern and contain the poor and lessons to be learnt from these three countries. The first section covers livelihood strategies in urban and rural areas as individual and small-scale collective response to the condition of insecurity. Insecurity in the countries of the South is characterised by a high degree of uncertainty of the availability of income opportunities. The second section looks at state responses to insecurity and contributions on social protection measures taken by the respective IBSA governments. The third section discusses whether alternative development paths can be identified. The aim is to move beyond ‘denunciatory analysis.’ Livelihood strategies as well as public policies in some of the cases allow for the building of new spaces for agency and contestation of a neo-liberal mainstream which provide emerging and experimental examples. The book develops new thinking on Northern welfare states and their declining trade unions. It argues that these concepts, knowledge and policy innovations are now travelling in three directions, from North to South, from South to North, and between Southern countries. This book provides unique insights for researchers and postgraduate students in development studies, social policy and industrial sociology. The green economy: a wolf in sheep’s clothing or an alternative development path in South Africa?